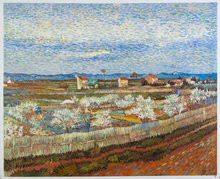 Orchard in Blossom is a painting that Van Gogh made during his stay at Arles. 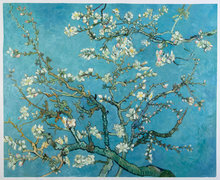 The beauty of the flowering orchards has been captured in a very simple way in this painting. The beautifully bloomed orchard tree, the patches of lilac soil, a small green patch with a green tree, an orange roof and the blue sky is replicated by our highly qualified artists. 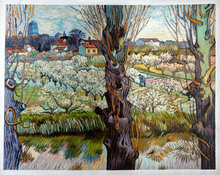 Van Gogh moved to Arles in Feb 1888, when he was suffering from smoker’s cough and fell ill because of drinking. Initially he found Arles very exotic – as if it was a different world altogether. Although the weather was getting better in Arles, it was not always convenient to paint, while being outside. 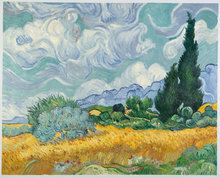 In his letter to his brother Theo, Van Gogh mentioned that it was the wind that made it really tough to paint. However, he had found a way out by fastening his easel to pegs that were driven deep into the ground. 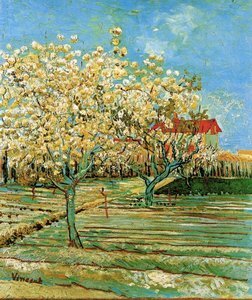 An Orchard painting that was rather simple with a white tree, a square patch of green, a small green tree, an orange roof, lilac soil and an expanse of the blue sky is how Van Gogh described this painting to Emile Bernard, his friend. 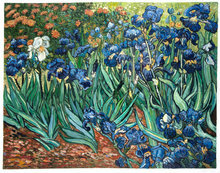 This particular painting was made by Van Gogh for his brother Theo for May Day. As he described the work to his brother, the painting was a frenzy of impastos of lilac and the faintest yellow on a background that was full of original white mass.